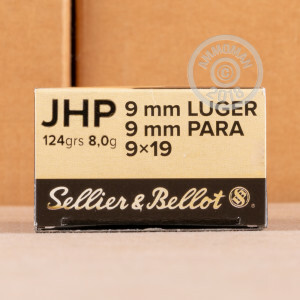 This 9mm round by Sellier & Bellot sports a 124 grain projectile, which is the heavier of the two bullets most commonly available in its caliber. This bullet is optimized for self-defense because of the hollow point in its tip, which will cause it to expand dramatically during penetration to give it a higher probability of striking a vital. The bullet’s tough copper alloy jacket will facilitate penetration upon impact, and sports notches running down its side to reliably direct expansion outwards. 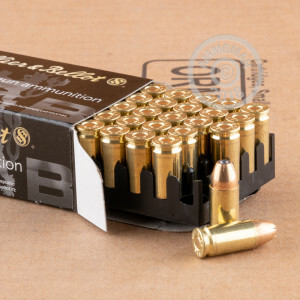 This cartridge further offers a factory fresh brass casing that is ideal for handloading, a non-corrosive Boxer primer that will stay ready to ignite even after having been stored for a long time, and a clean burning propellant which will keep you bore and action in good shape. You can count on Sellier & Bellot’s nearly 200 years of experience, state of the art manufacturing process, and stringent quality assurance protocol when you’re selecting the round that you might one day stake your life on.